This measure shows how Long Island’s standard of living among households at different income levels has changed from year to year. The chart plots the household income at the top 10%, the median, and at the bottom 10% of the Long Island income distribution. It also includes the U.S. median income. The present data are based on the American Community Survey one-year estimates. Index reports prior to 2014 were based on the 3-year moving average of the Current Population Survey March Supplement. The ACS utilizes a much larger sample for estimating county and regional statistics. The analyses refer to all households, regardless of their size. Household incomes are reported in 2013 dollars. As of 2013 (the latest year for which data are available): * The United States median household income is down 5% since 2005 and down 8% since 2008. 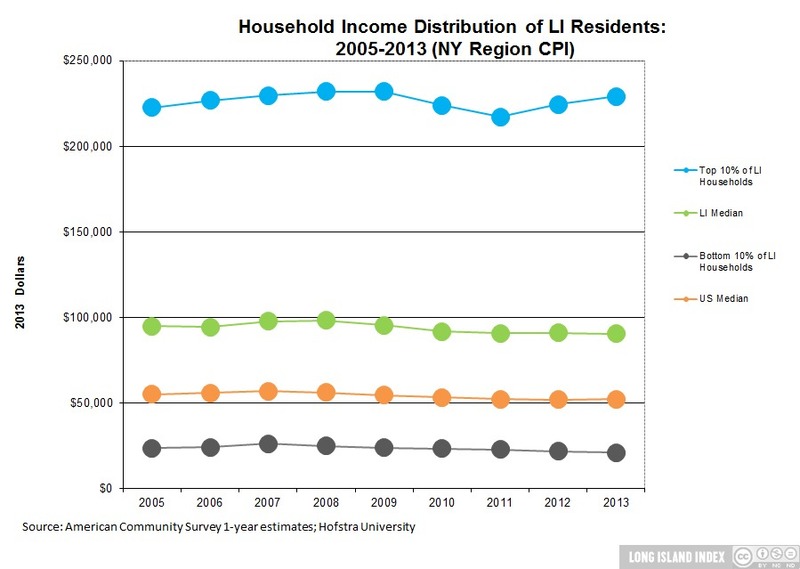 Long Island median household income is also down 5% since 2005 and down 8% since 2008. On Long Island, the income at the point that defines the start of the top 10% of households in 2013 earned 10.8 times more than the income at the top end of the line that defines the bottom 10% in 2013, and 2.5 times more than the households at the median income. Household income of the most affluent households has risen each of the last three years from its post-recession low point in 2011 (an increase of 5.4%). Median household income has been essentially flat since 2011. Household income for the least affluent has fallen an additional 7.9% during that same period. Household Income of the lowest 10% has dropped 19.6% since its pre-recession high in 2007. These patterns indicate that there is a wide gap between the top-earning 10% of households (starting at $229,080 in 2013) and the households earning no more than the median income ($90,480). Households in the bottom 10% earned no more than $21,200 in 2013.